Before 2011, young sailors entering college on Long Island found themselves leaving their homeports for New York City or for other colleges around the Northeast and around the country. Though many wanted to stay home and attend SUNY Stony Brook University (SBU) in Stony Brook because of its outstanding academics and reputation, they faced an important problem. 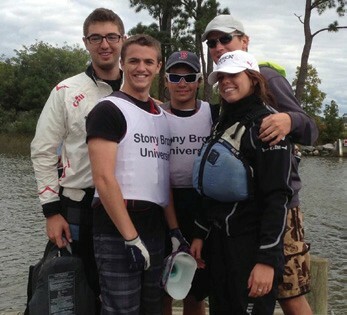 Stony Brook had not had an active sailing team since 1980. While there had been attempts to start a new team over the years, it was only in 2011 when four fiery and committed SBU undergraduates – Lauren Maloney, Rachel Berger, Kyle Buescher and Zachary Kyritsis – set out to establish a new team. 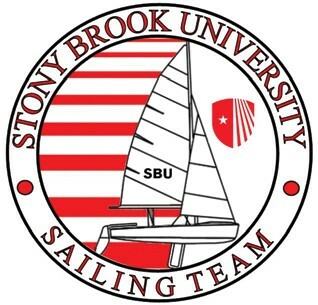 The intensely resolute Maloney took the helm as president of a resurrected SBU Sailing Club and the “core-four” worked their rudders off, recruiting and establishing the Seawolves sailing team. Rob Crafa, the head of the SUNY Maritime Sailing Team, was an invaluable advisor to the team, even inviting team members to SUNY Maritime College in Throggs Neck, NY to see their operations. Under Maloney the team started with no boats, no coach, no yacht club and no money. When she left the team and graduated in 2012, the team had a fleet of 11 420s, a superb coach, a home at a friendly yacht club, and a generous annual budget from the SBU Undergraduate Student Government. In 2011, the team entered the Middle Atlantic Intercollegiate Racing Association (MAISA), the regional conference for the Inter-Collegiate Sailing Association (ICSA), the national governing authority for college sailing competition in North America. The team’s very first event was the Storm Trysail Foundation’s Intercollegiate Offshore Regatta, a big boat event hosted by Larchmont Yacht Club, although their early MAISA regatta participation and success was limited. 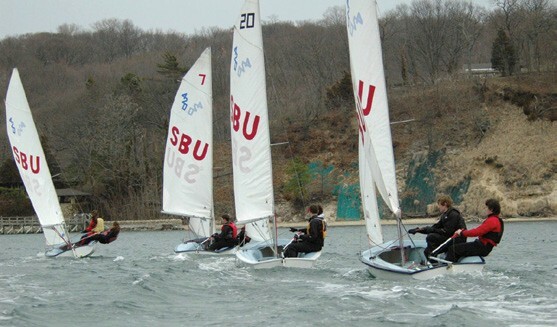 In 2012, the team purchased Port Jefferson High School’s fleet of Club 420s, hired experienced sailing coach Geoffrey Loffredo, and was invited by the extraordinary sailing community at Setauket Yacht Club to base the university’s sailing operations at their facilities on Port Jefferson Harbor. That same year, undergraduate Zach Kyritsis took over as president. Under his and coach Loffredo’s leadership the team experienced stunning success. Varsity squad members Constantine Spentzos, Heather Grosso, Mary Loffredo, Cody Murphy and Kyritsis all had first place finishes in intercollegiate regattas. MAISA upgraded the team’s membership in the conference to compete in regional and national championship regattas and the team catapulted itself 21 places in the college rankings, from 43 to 22 during their spring campaign. Much of the team’s success this year is due to coach Loffredo’s dedication and his ability to form a united, cohesive group of dedicated sailors. During the semester, he holds classroom instruction once per week and has three weekly practice days to help accommodate students with difficult schedules. The team’s Facebook page has post after post demonstrating how the team has bonded and how newcomers feel so welcome. Encouraged by Loffredo, team members who can sail, but have very little experience in college racing are cultivated by other team members. Ironically, some of the best sailors have turned out to be students who had never stepped onto a boat. Nikolas Floros, Alicia Elliot, Ken Myers and Audrey Sloma joined the team to broaden their horizons and have adventures. And even though none had been on a sailboat before joining the team last year, four months later they were some of the best sailors at intercollegiate regattas. In fact, Alicia confidently crewed during 35-knot gusts and six-foot waves at the Intercollegiate Offshore Regatta last October. Long Island college students now have a university team they can call their own. High school or college students who want to inquire about the team may contact coach Geoff Loffredo at geoff.loffredo17@gmail.com. All sailors are welcome to join our Facebook page at facebook.com/groups/sbusailing/ and visit our website at stonybrooksailing.wordpress.com.